Jhangri is a sweet I can eat all day long. When my MIL was in June, she made Jhangri and showed me how to do it and asked me to try putting with less quantity. I wanted to try it for a long time but because of some personal reasons, didn't get time to try it. But last week I was going through Rak's Jhangiri Recipe and got tempted so much. Yesterday I made up my mind to try and luckily it came out really good. First three pieces were not so good cos I soaked it in the sugar syrup for a long time. It became soggy. But then I managed to find out the reason and finished the project! 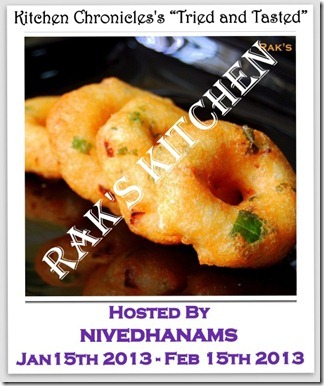 I am sending this Jhangri recipe to I am sending this Poli recipe to Tried & Tasted Event - Raks Kitchen, this time Sowmya of Nivedhanam is hosting, an event by Kitchen Chronicles by Lakshmi Venkatesh. 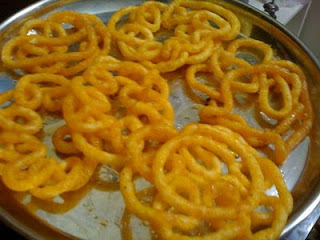 Very tempting jangiri, truly wish to have some rite now..
Woww vidhya, jhangiri luks great!!! Haven t tried jangiri at home yet....your version sounds dooable n perfect...thanx dear. looks perfect for the evnt,..its been so long since i prepared this,. Your trial has been very successful Vidhya, that makes my resolve stronger! very nicely done!!! So tempting!! !